The Disney short film, Frozen Fever, is sure to have little kids falling in love with the royal sisters of Arendelle all over again. And since the film is all about a birthday party Queen Elsa is throwing for Princess Anna; there’s a good chance those kids will want their own “just like Anna’s” birthday celebrations. And while the film may be short on time, it’s certainly not short on inspiration for party ideas to help make those Frozen Fever birthday dreams come true. Any Frozen-themed party invitations would do for this event, but if you want to specifically indicate that this is a Frozen Fever party, you can use elements unique to the film, such as the cute little snowgies characters that Elsa creates when she sneezes, the sunflower adorned birthday cake or the birthday bugle. For a simple invite that fits the theme, use your favorite Frozen Fever images to create postcard-style invitations. Green, blue, yellow and pink balloons and party streamers. White tablecloths with a sunflower print (if you can't find one, use a sunflower stamp and yellow ink to stamp your sunflower pattern on a plain, white tablecloth). Use bowls filled with sunflowers as your centerpiece. Banners, flags, and garlands inspired by the sunflower palace flags seen in the film. A “Happy Birthday” banner with splattered paint lettering like the one Kristoff made for Anna. This could be fun to have the kids help make before the party. Of course, a Frozen party would not feel complete without a few snowflakes, toss some snowflakes into your decor for a whimsical little nod to the original film. Birthday Banner Scramble: Mix up the letters of your birthday banner and hide them around the party space. Have kids search for the letters and unscramble them before time is up. Catch the Snowgies: In the movie, Kristoff fends off a barrage of snowgies with a large, overturned bowl. Give the kids a bowl, toss them some mini snowmen (use crumbled up paper) and see who can catch the most. Follow the string: Wind, string all around the party space and, have guests follow it to the cake or a prize (just like Anna had to follow a string to her party). 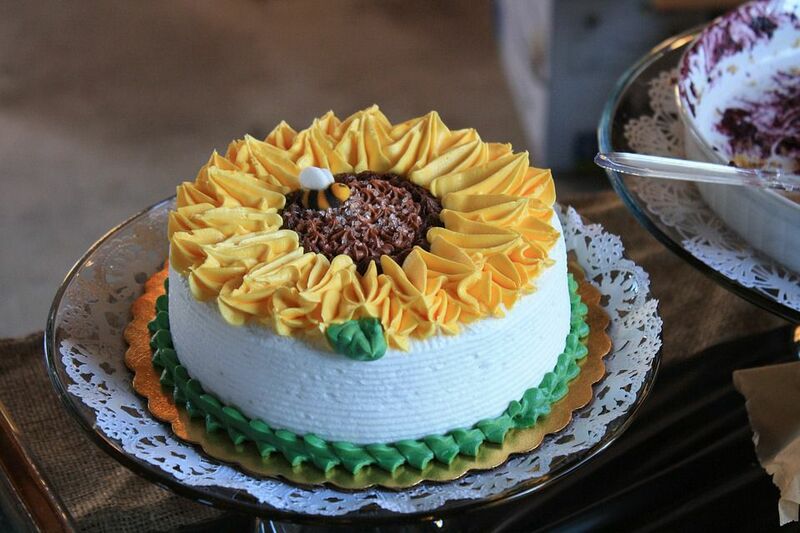 A sunflower birthday cake like Anna’s. Birthday bugles (Bugles corn chips). Sunflower cheese and fruit platter (use back grapes as the center and orange cheese triangles to from the petals around the grapes). A flower pot and packet of sunflower seeds. Sunflower-beaded bracelets, necklaces, and headbands. Watercolor paint set and pad of paper (to make their banners).